Transkaukazja: “Border-Key-Neuropa” Landart an der Neiße! 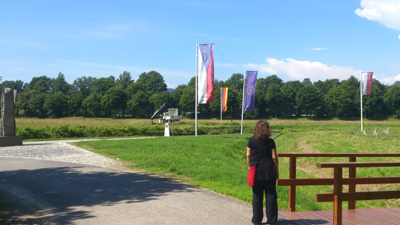 During „depARTment walk“ at 2013/07/12 visitors and artists could see the presentation of land art objects as the results of a two-week residence of six artists from Caucasus and eight from Germany. The main focus lay on borders – how to experience, to challenge and open them up. Together we could gain inside in this scenically, culturally and historically amazing region. The participating artists were Ana Riaboshenko (GE), Chingiz Babayev (AZ), Elene Rakviashvili (GE), Eva Harut (AM), Sabina Shikhlinskaya (AZ) and Mariam Mughdusyan (AM), as well as Dirk Fröhlich, Elena Pagel, Holger Wendland, Johanna and Michael Dobbelt, Matthias Jackisch, Matthias Schumann and Melissa Wagner (all DE). Each of the participating artists have created an object including typical materials from her or his home country with cultural meaning and symbolic nature. It can be the emplacement of plants, trees etc. as well as a usage of special soils, stones, labels written in the language of the country, typical objects and products etc. All created land art objects will have been documented with photo and film, scanned with GPS and presented online like a virtual borderland walk on website or internet blog. In cooperation with Hillerschen Villa Zittau, Internationales Begegnungszentrum (IBZ) in the monastry of Marienthal and Medienkulturzentrum Dresden. With the support of the programme Culture of the European Union, the Cultural foundation of Saxony, the European Cultural Foundation and the programme Wir für Sachsen.